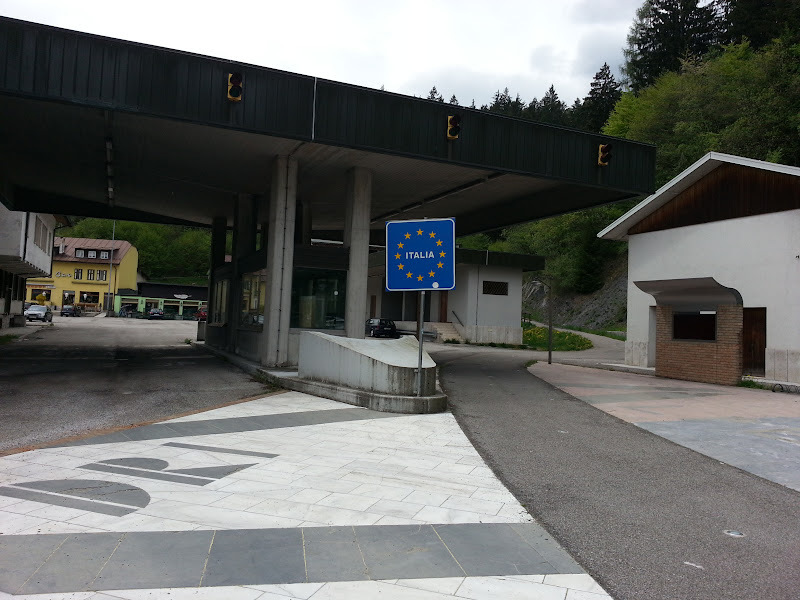 Shortly after I left Villach, I reached the deserted Italian border crossing: Hello country #8! I was surprised to have to dodge a snake on the path. I would've expected it to be too cold and high for them. 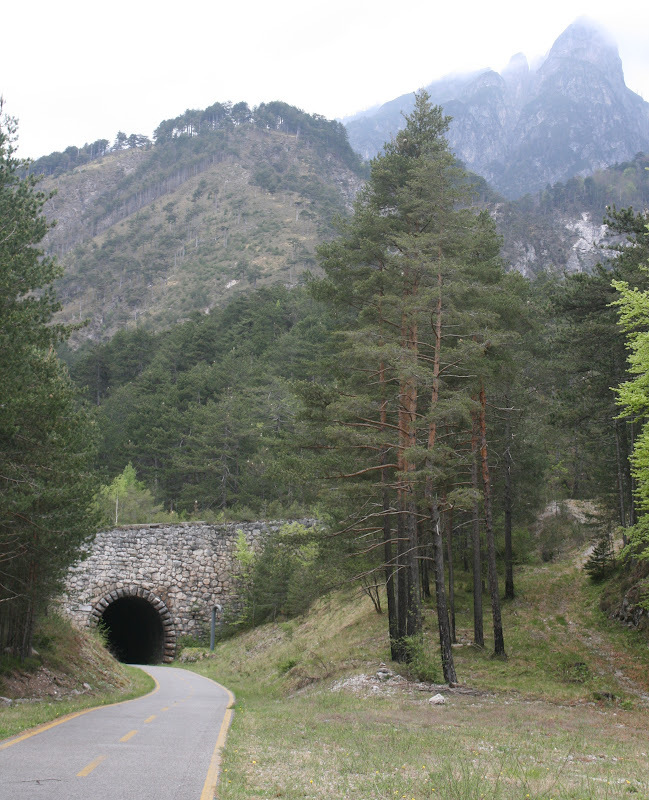 The Italian part of the cycle route began following a former rail line, making use of the frequent rail tunnels along the valley walls. 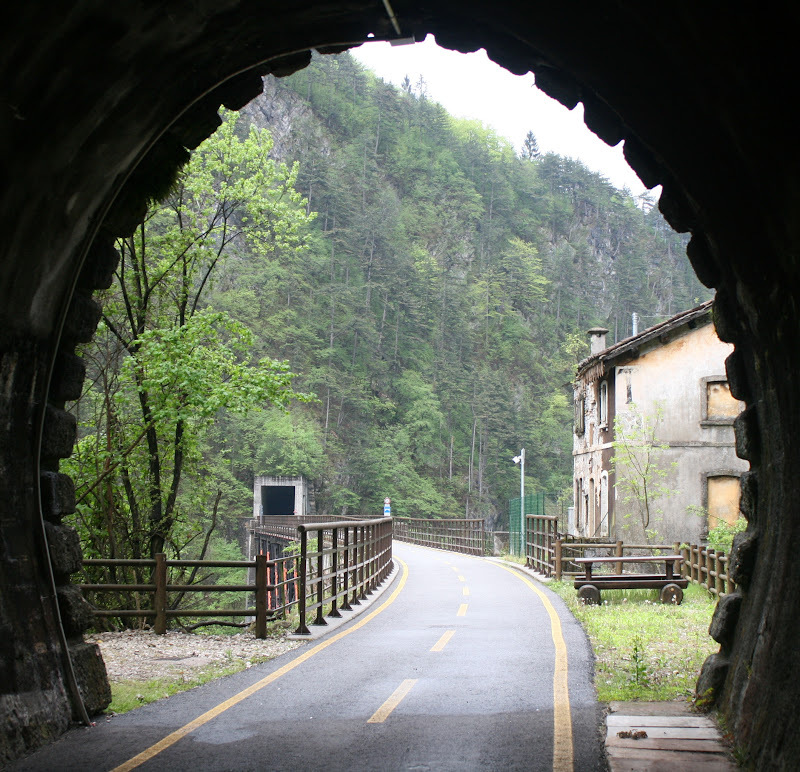 It began to train as I passed through Tarvisio, and I stood under a motorway overpass for an hour waiting for it to wane. In the end, I just cycled on. It was a shame about the weather, but overall this was one of the best days cycling that I've done. It was a gradual descent and the villages were beautiful. The ride through the Pontebbana villages might be the best single day of riding around. Once again, finding a camping ground proved a problem. I eventually turned off the route at Bordano and cycled over a hill on a series of switchbacks to reach an alpine lake. There I stayed at the Camping Lago 3 Comuni. The next morning it poured down. I skulked in my tent until about midday, but I could pick up enough to know that a group of Italians at the camping ground were laughing at the guy cycling across Europe, so I packed up my sodden tent and set off in the rain. I rejoined the cycle route, but the signage wasn't great and I would periodically lose it again. It followed a labyrinthine path through the sprawling city of Udine, where nearly everything was closed because it was May Day. The only place that I found that was open was an icecream shop. It's lucky I can eat icecream in any situation. In the centre of Udine, it began to pour and I was drenched. I could feel the water sloshing inside my boots and my bicycle computer stopped working because the contacts were soaked. 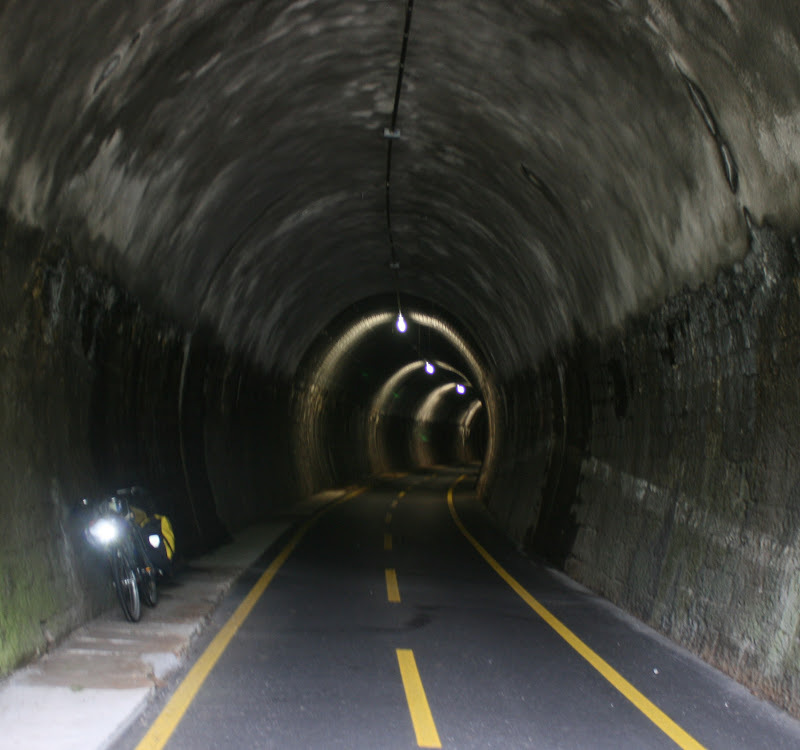 The Italian cycle infrastructure isn't really designed for rain, and I fell off my bike twice - once on a skiddy clay road and once on a metal bridge that was completely slick. 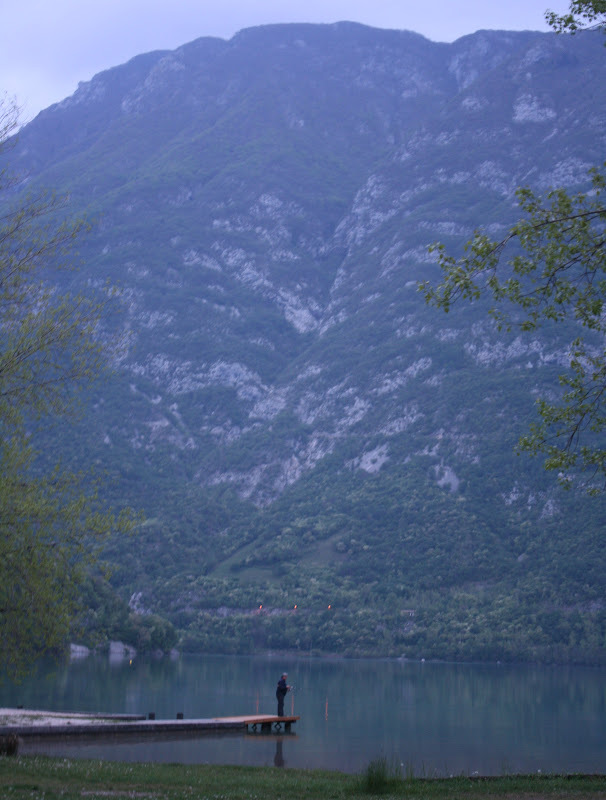 After only starting at midday, I was pleased to reach the Adriatic coast in the evening. It was a shame to finish the Alpe Adria route with one of the more unpleasant days of riding on my trip, but it was entirely the weather's fault. I was thrilled to find the Belvedere Camping Village had a pizzeria and wolfed down a pizza and fries. 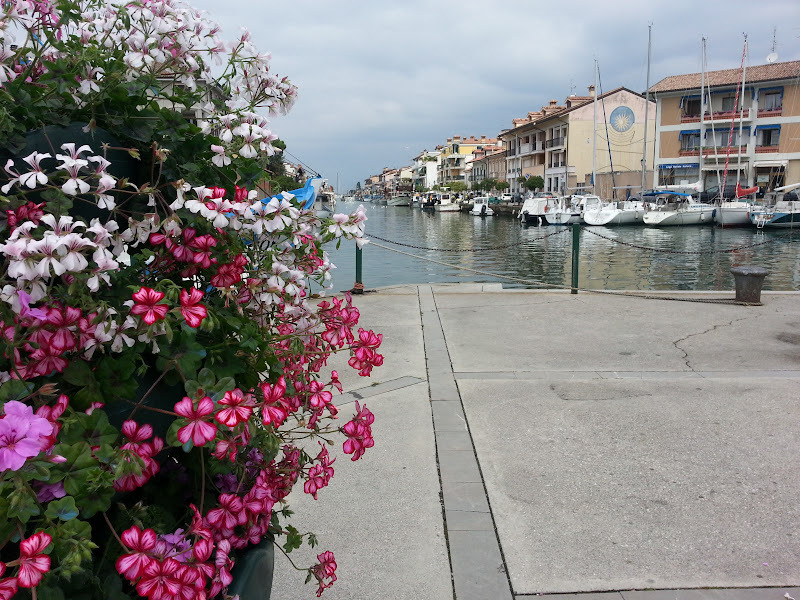 I took a rest day and travelled by bus along a long causeway to the fancy island town of Grado. There are archaeological ruins scattered around the town. I went grocery shopping and bought a 4 pack of toilet paper. I packed a lot of it into my boots to try to dry them out after their soaking the day before. I also did a bunch of laundry in my travel bucket and hanged it up to dry. The high humidity meant it wouldn't dry. 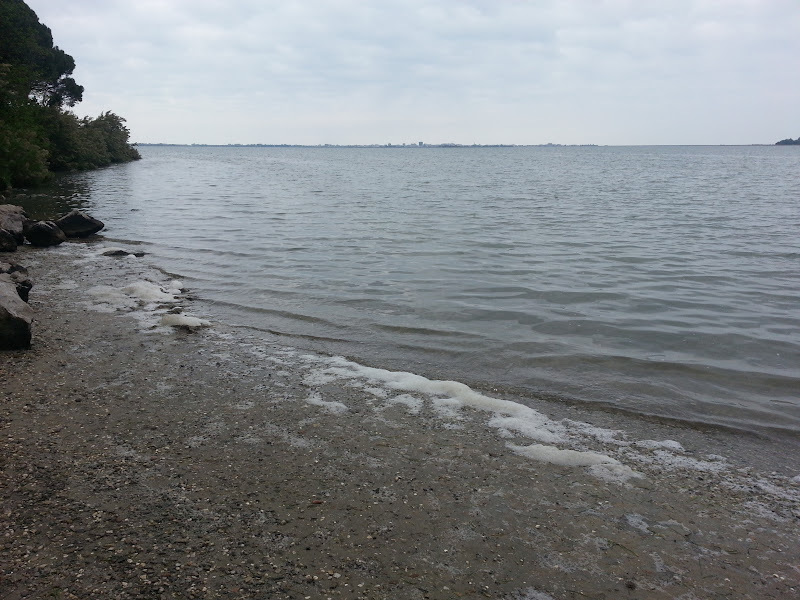 I left Belvedere and cycled back along the causeway to Grado. I followed a cycle route for perhaps 10 kilometres, but it joined a busy traffic road on the way to Monfalcone. I carried on around the coast and something absolutely remarkable happened: the busy traffic completely stopped. For some reason, the police had shut off the coast road to cars and I had it all to myself. 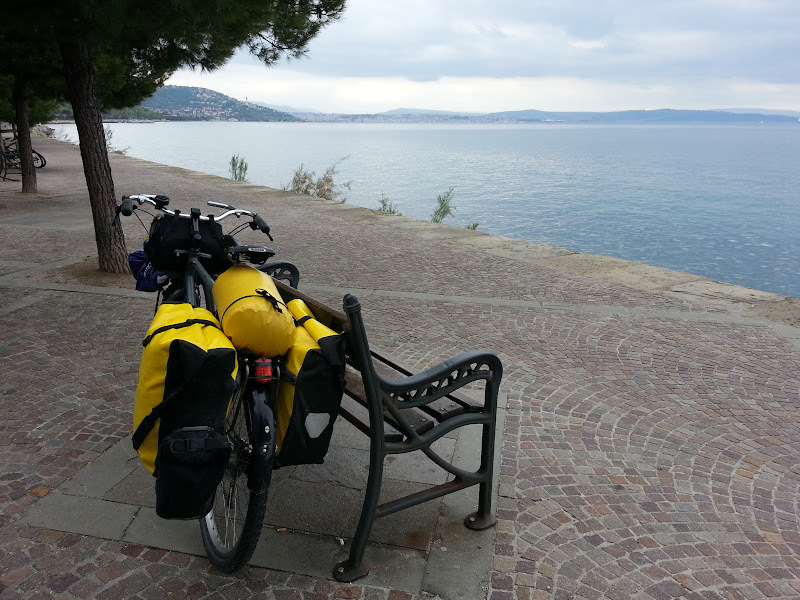 I zoomed along on the beautiful edge of the Adriatic all the way to Trieste. I have no idea why - perhaps it was the local marathon or something. 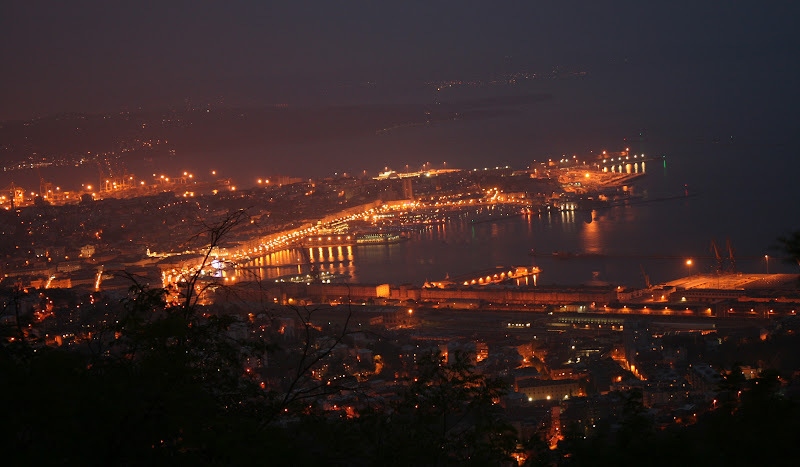 Trieste starts on the waterfront, but it climbs steeply almost immediately. I slowly crawled up the hill to the Campeggio Obelisco above the city. It was completely rocky and I had a really tough time getting my tent pegs into the ground. I wandered into the town of Opicina for dinner. I had a delicious bowl of goulash. As I took this photo of Trieste from a viewing platform at the camping ground, a group of about 10 wild boars trotted past in the bush just below me.